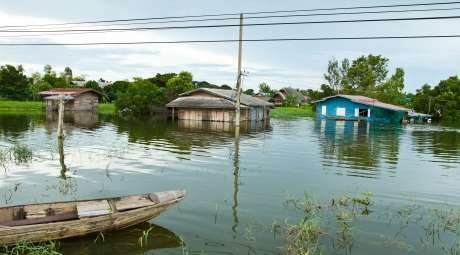 Global warming could cause frequent and severe failures of the Indian summer monsoon in the next two centuries, new research suggests. The effects of these unprecedented changes would be extremely detrimental to India's economy which relies heavily on the monsoon season to bring fresh water to the farmlands. The findings have been published today, 6 November, in IOP Publishing's journal Environmental Research Letters, by researchers at the Potsdam Institute for Climate Impact Research and Potsdam University. They found that as we move towards the end of the 21st, and into the 22nd, century, increasing temperatures and a change in strength of the Pacific Walker circulation in spring could cause more frequent and severe changes in monsoon rainfall. The Walker circulation usually brings areas of high pressure to the western Indian Ocean but, in years when El Niño occurs, this pattern gets shifted eastward, bringing high pressure over India and suppressing the monsoon, especially in spring when the monsoon begins to develop. The researchers' simulations showed that as temperatures increase in the future, the Walker circulation, on average, brings more high pressure over India, even though the occurrence of El Niño doesn't increase. These failures of the monsoon system – defined in the study as a 40 to 70 per cent reduction in rainfall below normal levels – were unprecedented in the researchers' observational record, which was taken from the India Meteorological Department and goes back to the 1870s. The immediate effects of climate change on monsoon rainfall have already been observed by some researchers; however, the patterns of response in the coming decades are not uniform across different models and studies. Lead author of the study, Jacob Schewe, said: "Our study points to the possibility of even more severe changes to monsoon rainfall caused by climatic shifts that may take place later this century and beyond." This Liberal Science must be de-funded.